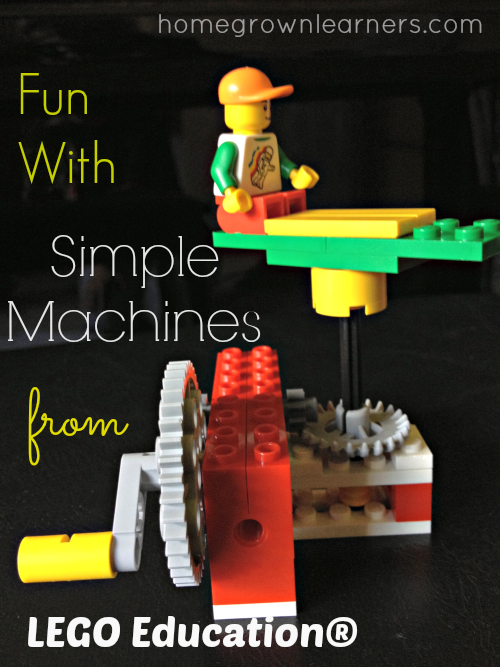 One of the best additions to our LEGO resources has been the Simple Machines set from Lego Education®. Not only has my son enjoyed free building with this set, but he has also sat down with the many instructions and has begun to build and experiment on his own. With regular LEGOS, my son builds, we take pictures, display the finished products, and he always has fun. With the products from LEGO Education®, however, we can delve DEEPER into learning about science, technology, education and math (STEM). The Simple Machines set has been such a valuable resource in our home! I did not know (until just a few months ago) that LEGO Education® makes products SPECIFICALLY for homeschoolers. We have had the pleasure of using the StoryStarter set and also the Simple and Motorized Mechanisms set. You can see read about those on my LEGO Learning page. 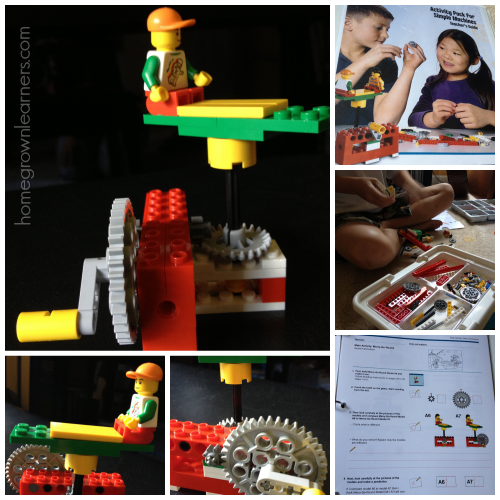 This Simple Machines set with printable activity guide is another product LEGO Education® makes just for us! The collage above takes you through one of the first lessons in the activity pack. My son built (using the instructions) a Merry-Go-Round. He learned about gears and gear ratios. He also learned lots of other great vocabulary words and concepts. In this particular model, the gear ration is 3:1. One of the gears had 24 teeth. The other had 8. It took 3 turns of the crank to make the minifig go around one time. Then, my son modified the model just a bit to change it to a 40 tooth gear and a 24 tooth gear. The ration changed to 5:3. I was able to talk him through all of this. The lessons are completely scripted, with a guide printed for me. A CD with printable worksheets even goes along with this set. This would be perfect for individual homeschool use or a co-op setting, too. This set will be an integral part of our homeschool science in the coming year. *If you want to find out more about this set, visit LEGO Education®'s site to see all of the specifics. I think you will be VERY impressed. We had seen many balloon car challenges online. I presented the task to my son last week. I showed him a picture of a balloon car. We watched a few videos. I told him he could just use his Simple Machines set. The car must be vertically and horizontally stable. The balloon needs to have enough space to inflate. The wheels should be protected so the balloon doesn't hit them. This little task is harder than it looks! I believe it took well over an hour to achieve success. It's funny, though, because he never got discouraged. It was a compulsion to make the car GO. Playing with LEGO bricks can be like that. Sometimes it's just hard to be FINISHED! Grant was so pleased with himself (I didn't help at all!) and asked me to make a video. 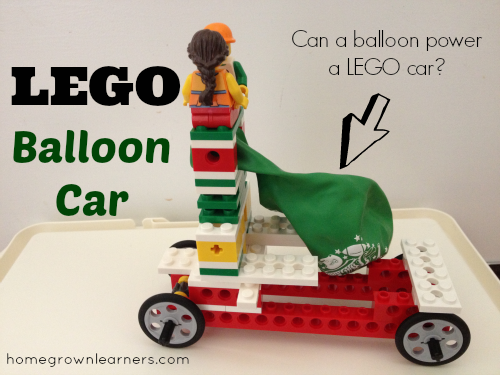 Want to know more about the SCIENCE behind the balloon car. My friend Paige, at Elemental Science, has a GREAT explanation! As a parent I can't ask for anything more than focused learned, experimentation, and a passion to know MORE. LEGO Education® has helped me nurture all of these in my child. I am a member of the LEGO Education® blogger program. I was given this product in exchange for my honest review. No other compensation was received.